Summary: The goal of this project is to improve nesting beach habitat and marine conditions for nesting sea turtles and hatchlings on St. Joseph Peninsula, and juvenile sea turtles that utilize near-shore habitats in St. Joseph Bay. This will be accomplished through the design, development, distribution, and display of materials that inform visitors and residents about the sea turtles, the many threats that they face, and how we can all play a role in helping to reduce these threats. 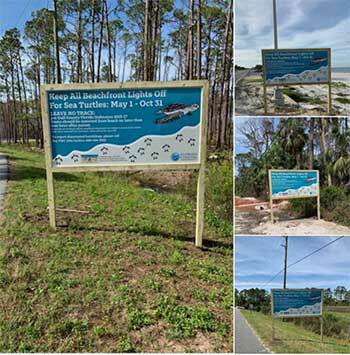 Gulf County has no specific budget for sea turtle and coastal habitat education. The Florida Coastal Conservancy addresses these needs by providing educational programs and materials aimed at mitigating the negative impacts caused by improper lighting, beach driving, beach debris, and other dangers to sea turtles. These negative impacts have increased as greater numbers of visitors and residents enjoy our once pristine beaches and Gulf and Bay waters.